Hello once again to all of you. It’s Andy Gesner and the staff from HIP Video Promo, and today, we’re proud to be bringing you the latest clip from one of the biggest bands in modern rock. Shinedown signed with Atlantic Records in 2002, and have been mainstays on the U.S. Mainstream Rock charts ever since. The Jacksonville quartet has placed all six of their singles in the top five, and captured the number one or number two position with their last three. “Save Me”, the lead single from Us And Them, held the top spot for twelve weeks – a mark exceeded only five times in the history of the chart. The track also soared to the #1 position on the Modern Rock charts, and became the theme song for WWE’s No Mercy. Shinedown’s profitable association with pro wrestling continued when the follow-up single – the bracing “I Dare You” – became one of the theme songs for the most recent iteration of WrestleMania. The exposure and mainstream radio airplay have helped to turn Shinedown’s recordings into consistent bestsellers: Us And Them has been certified double platinum, and sales show no sign of slowing. 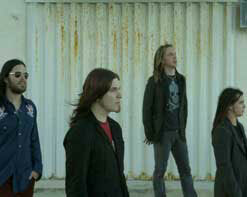 “Lady So Divine”, the latest single, seems a lock to continue Shinedown’s run of success. It’s a soaring and meditative example of modern rock grandeur, reminiscent of the more reflective side of Soundgarden or late-period Pink Floyd. The album cut is a seven- minute epic, building slowly over a dramatic drum and psych-guitar track and culminating in a smoldering solo by six-string titan Jasin Todd. Unconventionally, the single edit keeps the lead intact: much of the second half of the track is a showcase for Todd’s remarkable interpretive skills. The guitarist proves himself a master of heavy psychedelic blues – winding, bending, and scalding his way through a revelatory and often lyrical extended outro. Those who’ve been lucky enough to catch Shinedown in concert won’t be surprised at all that the band has decided to foreground Jasin Todd’s playing: the rough elegance of his six-string heroism has been a highlight of the quartet’s stage show for years. The band often carries an auxiliary guitarist whose subordinate role frees Todd to reach for the stratosphere. Shinedown’s reputation for thrilling performances has made the band a sought-after modern rock headliner – and this winter, the band toured America as one of the featured acts on the SnoCore tour, sharing top billing with Trapt and Seether. Perhaps more instructively, the group also supported Van Halen on their ’04 national circuit; Todd and Shinedown were able to stand next to guitar-rock legends, and indisputably measure up. The clip for “Lady So Divine” echoes the atmospheric and searching feel of the music. No humans appear in the video; instead, the camera follows the swift flight of an animated black bird over forests, through tunnels, and along city highways. The camera is restless; sliding from image to image diagnostically like a microfilm viewer, stopping suddenly, focusing in, pulling back. Images of caves and dark channels dot the film: a thatched hut, a cavern scarred with stalagmites, a gaping industrial hollow at the side of a road. The inky blackness within each aperture is at once threatening and inviting. The bird flies without fear, soaring into every opening and emerging in another, constantly searching out these wormholes between country and city, habitation and natural happenstance. Over the footage, strange rings are superimposed: they begin at the mouths of the caverns, and then radiate outward like thin ripples in the fabric of reality. We are truly honored to be working with the terrific folks at Atlantic Records, who continue to deliver outstanding videos like “Lady So Divine”. You can catch Shinedown as a co-headliner on the Equinox Tour with Trapt, Mercy Fall, and Halestorm. Look for them when the tour comes to a city near you. There will be plenty of copies of the double platinum Us And Them for on-air giveaways. If you need more info, call Andy Gesner at 732-613-1779 or e-mail us at info@HIPVideoPromo.com”>info@HIPVideoPromo.com. You can also visit www.AtlanticRecords.com, or www.Shinedown.com to find out more about Shinedown.